NASA will hold a press conference Thursday, April 13, 2017 to discuss ocean worlds beyond Earth. 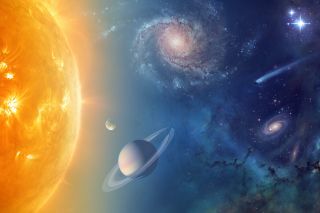 NASA will unveil new discoveries this week that involve alien oceans in Earth's solar system, space agency officials announced today (April 10). On Thursday, April 13, NASA will hold a press conference that will "discuss new results about ocean worlds in our solar system," according to a press release from the agency. The discovery will involve findings from the Hubble Space Telescope and NASA's Cassini spacecraft, which is orbiting Saturn. "These new discoveries will help inform ocean world exploration — including NASA's upcoming Europa Clipper mission planned for launch in the 2020s — and the broader search for life beyond Earth," NASA officials wrote in the same press release. NASA's ocean worlds press conference will begin at 2 p.m. EDT (1800 GMT) on Thursday and include a question-and-answer session with a panel of scientists from the Cassini and Hubble missions, as well as NASA's planetary exploration and science directorates. "Members of the public also can ask questions during the briefing using #AskNASA," NASA officials wrote. NASA's Cassini spacecraft has been orbiting Saturn since 2004 to make detailed observations of the ringed planet and its many moons. The spacecraft is scheduled to end its mission on Sept. 15 with a fiery plunge into Saturn itself to avoid contaminating the planet's icy moons, NASA officials have said. The Hubble Space Telescope, meanwhile, has been in orbit around Earth since 1990 and has captured spectacular images of the universe, including of some solar system planets, during its mission. Last week, NASA unveiled amazing new images of Jupiter as seen by Hubble as the giant planet approached opposition (its closest point to Earth for 2017) on April 7.